Even though we have engaged Attorney Craig Hunter to represent taxpayers in a suit that alleges the contract between Johnson Controls and ISD 709 is unlawful we still have many grievances to pursue in court and are raising additional funds for these challenges. This page outlines those concerns and we encourage other lawyers to contact us about representing us in court if they can develop a legitimate legal theory. For instance, How can a City-of-the-First-Class (Which the Duluth School District is claiming to be) levy property taxes against residents of neighboring townships? We sure would like someone to explain that to us and take the Board to court over it. 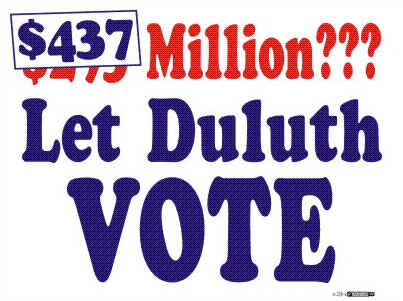 Let Duluth Vote's meetings are generally held at 6:30 PM, Thursday, nights at the Duluth Height's Community Club. (see map) Call 390-7768 to find out if there will be a meeting this week. The Red Plan must be stopped or modified. 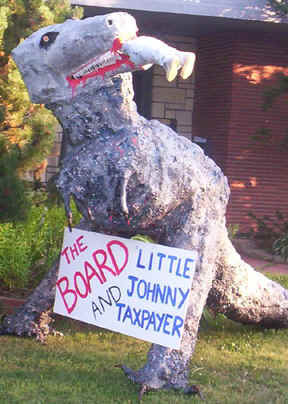 What did the Duluth School Board do? 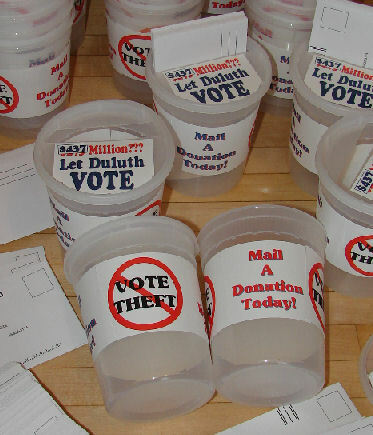 On June 19, 2007 the Duluth School Board voted to begin the single largest school makeover project in Minnesota history. It will cost Duluth, a city groaning under the weight of fiscal collapse, almost half-a-billion dollars - $437 million - in taxes. They will close Duluth's only modern High School - Central, sell off its premier property and move its students to a refurbished junior high school on a dangerously small lot. 1. They did it based on a novel interpretation of laws which previous school boards knew nothing about. 2. They authorized it in a community with one of the highest proportions of residents on fixed incomes and ranked one of the poorest cities in the state. "According to the United Way of Greater Duluth 2007 Community Impact Report, Duluth’s poverty rate is nearly twice that of the rest of the state." 3. They did it in defiance of two petition drives both of which quickly and easily gathered 3,000 signatures first seeking a vote on and then a compromise on the "Red Plan." 4. They did it despite $30 million spent by previous school boards specifically to maintain older buildings. 5. In forging ahead with the plan they surrendered their oversight to a Fortune 100 company with little comparable project management experience but an economic incentive to boost the cost as high as possible. The School Administration then lied or was clueless about how much this company would earn. The company was given the power to award itself and its subsidiaries multimillion dollar bids for the project. 6. Its plan would divide the City into rich and poor halves while abandoning its state approved desegregation plan. 7. It accepted a plan which created a new high school on a tiny, inferior and unsafe parcel while selling off the district's premier property for a song. 8. They did it knowing an angry public might vote against critical referendum for classroom spending slicing $11 million from the budget leading to teacher layoffs, overcrowded classrooms and canceled curricula. 9. They did all this on the cusp of a national economic downturn. 10. They based their decision not on a vote of all the people but on a survey of 300 people who had never heard the plan debated and who were not told the enormous cost of the plan. 11. They did it without asking questions and in their arrogance many of them did not bother to return email from unhappy voters who questioned their decision.